Last week you saw the photo of what the San Pedro Square Market looked like when the 49ers hosted their 2013 Draft Bash there, but there are other connections being made to San Jose as well. Cukui is a really cool clothing store in Japantown that embodies San Jose street art and culture. They approached 49ers quarterback Colin Kaepernick to see if he would be interested in a clothing line inspired by his tattoos. 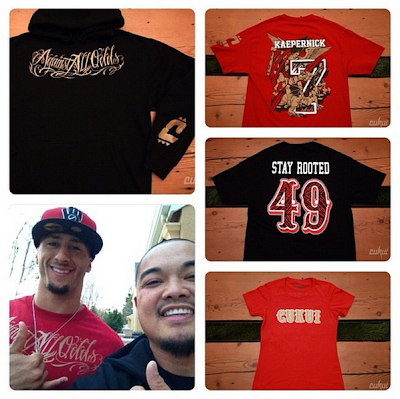 Kaepernick agreed and the new shirts shot up Cukui's business by 200-300%, with most of that being new customers. They are also one of the few pieces of 49ers gear designed and printed right here in San Jose. To check out Cukui's online store, just click this link. You can also visit their retail location at 229 Jackson Street.